such as the Ligurian Sea and the Strait of Sicily (Pansini et al. 1987; Maldonado & Uriz 1995; Bertolino et al. 2013a; Bertolino et al. 2013b). Additionally, some studies have suggested a continued input of sponge species from the Lusitanian region into the Alboran Sea over the Quaternary (Maldonado & Uriz 1995), despite sponges being sessile organisms with short-living planktonic larvae lacking recognizable strategies for long-distance dispersal (Maldonado 2006). Since global warming enhances northward migration of subtropical marine species (Coll et al. 2010), it is urgent to improve our knowledge of these deep-shelf Alboranian communities before the immigrants get integrated in them and further complicate both discrimination of the pre-warming original fauna and the understanding of future Mediterranean faunal shifts (Vermeij 2012). Materials and methods Within the frame of an EC Grant LIFE+ INDEMARES aimed to list and designate marine areas for the Nature 2000 Network in Spanish territorial waters, we explored the deep shelf (70 to 200 m) of the Alboran Island, using a remotely operated underwater vehicle (ROV) along with traditional dredging and trawling devices to collect benthic fauna. FIGURE 1. (A) Localization of the Alboran Island in the Mediterranean. (B) Distribution of the 25 studied sampling stations over the bathymetric map of the shelf of the Alboran Island. the information available from the video transects. Collected specimens were fixed in 4% formalin for 2–3 months, rinsed in distilled water, and subsequently transferred to 70% ethanol. Because of an initial fixation step in formalin, the collected sponge material is not suitable for molecular analysis. Taxonomic identifications were accomplished by considering the external morphology and skeleton, using standard techniques to prepare spongin fibres and spicules for light microscopy observation. Body features, spicules, and skeletal arrangements were described according to the thesaurus of sponge morphology (Boury-Esnault & Rützler 1997). When required, acidcleaned spicules were mounted on aluminum stubs, gold-coated, and studied through a HITACHI TM3000 Scanning Electron Microscope (SEM), following standard protocols for sample preparation. Features of the collected material were compared, when required, to those of holotypes and additional material borrowed from sponge collections of the Muséum National d’Histoire Naturelle (MNHN) of Paris, the Musée Océanographique of Monaco (MOM), and the Museo Civico di Storia Naturale Giacomo Doria of Genoa (MSNG). All collected material during the INDEMARES-Alboran cruises, holotypes included, has been stored in the Invertebrate Collection of the National Museum of Natural Sciences (MNCN), Madrid, Spain. The rocky outcrops standing out from soft bottoms, with their impressive rocky crests, walls, overhangs, and crevices, provided an optimal substrate for suspension feeders, often hosting a large variety of sponges, cnidarians, brachiopods, molluscs, sabellid tube worms, ascidians, etc (Fig. 2E). The ROV inspections revealed that encrusting, branching, and massive sponges often co-occurred on the outcrops, favored by the multiplicity of microhabitats that these tortuous rocky structures offer. Common sponges were Dysidea fragilis (Montagu, 1818), Sarcotragus pipetta, Hexadella racovitzai, Penares helleri (Schmidt, 1864), Crambe tailliezi, Terpios fugax, Caminus vulcani Schmidt, 1862, Dercitus plicatus, Craniella cranium (Müller, 1776), and also several species of Suberites, Calthropella Sollas, 1888, Erylus Gray, 1867, Haliclona Grant, 1836, Spongosorites Topsent, 1896, and Phorbas Duchassaing & Michelotti, 1864. Large astrophorids (Fig. 2F), such as Geodia spp., Stelletta spp., Pacahastrella monilifera, Poecillastra compressa, Characella pachastrelloides, Vulcanella aberrans, along with small digitate and stalked sponges were also present, though in lower abundance. Large areas of the deep shelf were covered with soft bottom, particularly on the north side of the island. The substrate mostly consisted of coarse sand mixed with calcareous gravel, more rarely incorporating a low proportion of mud. In contrast to the above-described hard-bottom communities, the soft bottoms were poor in sponges. Nevertheless, despite their general low sponge abundance, this bottom type hosted scattered individuals of rare and/or endemic species, such as Axinella salicina (Fig. 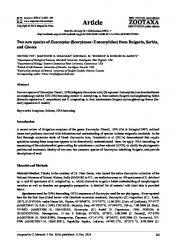 2I) and a new species of the genus Endectyon. A total of 631 demosponges sensu lato: (i.e., Demospongiae + Homoscleromorpha) have been listed for the Mediterranean (Voultsiadou 2009; Calcinai et al. 2013; the present study). Interestingly, the bottoms around the Alboran Island host 194 demosponge species (Table 6), which means about 30.4% of the total Mediterranean demosponge fauna. Such a remarkable percentage points clearly this island shelf to be a remarkable biodiversity hotspot in terms of demosponge fauna (and probably of several other groups of benthic invertebrates as well). Altogether, the abundance and taxonomic singularity of the sponge fauna occurring in these deep-shelf bottoms strongly suggest these habitats to be accommodated within the environmental protection of the Nature 2000 Network. FIGURE 2. Benthic communities on the deep shelf of the Alboran Island in which sponges are important members. (A) View of a rhodolith bottom dominated by cnidarians and sponges. The most abundant sponges were Phakellia ventilabrum (Pv), Phakellia robusta (Pr), and Bubaris vermiculata (Bv). (B) Detail of a rhodolith, largely encrusted by Bubaris vermiculata (Bv). (C) View of a gently sloping rocky bottom, showing large specimens of Phakellia robusta (Pr) and Poecillastra compressa (Pc) together with a dense "canopy" of small digitiform, claviform and globiform sponges, such as Axinella vellerea (Av) and Crella pyrula (Cp). (D) Individual of Vulcanella aberrans (Va) surrounded by small globiform and digitiform sponges. (E) Benthic community on the outcrops dominated by cnidarians, including the octocoral Corallium rubrum. Abundant massive, submassive and encrusting sponges are common under the gorgonian forest. (F) Large astrophorid (Geodia spp.) sighted from the ROV on the top of an outcrop. (G) Collected specimen of Crella (Yvesia) pyrula (MNHN-Sp136-DR44). (H) Collected specimen of Rhizaxinella gracilis (MNHN-Sp22-BV14). (I) A solitary specimen of Axinella salicina located by the ROV on a coarse-sand and gravel bottom, a substrate type that generally shows low abundance of sponges. Systematics Here we provide taxonomic description of eight demosponges collected from the deep shelf of the Alboran Island, which we consider of special interest because they are new to science, are new records for the Mediterranean Sea or are exceptionally rare species. Phylum PORIFERA Grant, 1836 Class DEMOSPONGIAE Sollas, 1885 Order ASTROPHORIDA Sollas, 1887 Family ANCORINIDAE Schmidt, 1870 Genus Jaspis Gray, 1867 Diagnosis. Encrusting or massive sponges without triaenes; choanosomal skeleton composed of oxeas irregularly interlaced, ectosomal skeleton formed by a layer of paratangential oxeas generally smaller than those in the choanosome; microscleres are euasters without a centrum; never being spherasters (sensu Uriz 2002). Jaspis eudermis Lévi & Vacelet, 1958 (Figs. 3A, 4; Table 2) Material examined. Specimen MNCN-Sp71-BV10 collected from Stn. 10 (Table 1; Fig. 1). Comparative material: Holotype of Jaspis eudermis Lévi & Vacelet, 1957 (MNHN DCL-738) from Princess Alice Bank, Azores (Stn. 62; 37º47’N 29º03’W, 330 m deep, 1955–1956). Macroscopic description. Creamy white (in alcohol), cushion-shaped sponge, being 45 x 23 mm in size (Fig. 3A). Consistency firm, but friable. Surface nearly glabrous, covered by a friable, detachable, thick membrane (crust-like), with no discernible aquiferous openings. At the zones where the ectosomal crust is lost, subdermal aquifer canals of up to 1mm in diameter are evident. FIGURE 3. (A) Specimen of Jaspis eudermis Lévi & Vacelet, 1958 collected from the Alboran Sea and photographed on graphic paper (MNCN-Sp71-BV10). (B) Three Alboranian specimens of Hemiasterella elongata Topsent, 1928 (from left to right, MNCN-Sp66-BV21, MNCN-Sp66 B & A). Skeleton. Megascleres are oxeas, which seem to occur in two categories. Oxeas I are 1125–2000 x 20–40 µm and fairly abundant. They are once or twice slightly bent, frequently asymmetric, usually with acerate tips, occasionally blunt (Fig. 4A–B). Oxeas I showing irregular shapes are also occasional (Fig. 4C). Oxeas II are 390– 1500 x 5–10 µm, and comparatively quite scarce; they are slightly curved, sometimes centrotylote, and with conical or acerate ends (Fig. 4A). Microscleres are oxyasters, with 12–20 conical, smooth actines (Fig. 4A, D); their total diameter ranges from 20 to 65 µm, but with no discernible size categories. There is an ectosomal, crust-like skeleton consisting of abundant oxyasters and tangential oxeas (mostly type II) irregularly disposed in small groups. The choanosomal skeleton consists of oxeas in disordered arrangement, along with abundant oxyasters. FIGURE 4. Jaspis eudermis Lévi & Vacelet, 1958: (A) Line drawing of the spicule complement of the Alboranian specimen (MNCN-Sp71-BV10), consisting of oxeas I (a) with acerate or blunt ends (b), oxeas II (c) with acerate or conical ends (d), and oxyasters (e). (B) Light microscope micrographs of oxeas I (a) and oxeas II (b). (C) An abnormal end (ab) of an oxea I next to an oxyaster (ox). (D) SEM micrograph of an entirely smooth oxyaster. (E) SEM image of several oxyasters of the holotype of J. eudermis (Stn. 62 MNHN DCL738), one having some large spines (sp) on some actines. (F) Detail of an oxyaster actine of the holotype showing minute spines (sp). oxyasters of J. incrustans measure only up to 26 µm in total diameter and their actines are clearly spiny rather than smooth (Maldonado 1993). Our material fits reasonably the only brief description available for J. eudermis, which corresponds to the holotype, a fragmentary, 2 x 2 x 1 cm, cushion-shaped sponge. It was reported to have a single category of 1200– 1650 x 45 µm oxeas (versus two in our specimens) and 35–45 µm oxyasters. The oxyasters were pictured by Lévi & Vacelet (1958) as having more than 10 actines with a smooth (not spiny) surface. Our revision of the holotype indicates that there are indeed two size categories of oxeas, discernible not only because of their thickness (1225– 1725 x 30–60 µm and 660–850 x 8–10 µm, with some occasional transitional stage), but also because of their shape, being the smaller category isodiametric and more markedly curved than the fusiform oxeas of the larger category. This reinterpretation of the oxea size distribution brings our specimen and the holotype in full skeletal agreement, as they also share the general traits of the macroscopic morphology and skeletal architecture. Furthermore, they both are the only Jaspis material in the Atlantic-Mediterranean region having large, "smooth" oxyasters with more than eleven actines. In this regard, our SEM re-examination of the holotype provides new interesting information. The oxyasters of the holotype measure 30–55 µm in total diameter and have 16 to 20 actines. Most of the actines are entirely smooth (Fig. 4E), as it also happens consistently in the Alboranian specimen (Fig. 4D). Nevertheless, under high SEM magnification approximately 20% of the oxyasters of the holotype show subtle microspines in one or more of their actines (Fig. 4F). In very few occasions, large, isolated spines also occur (Fig. 4E). Therefore, the "smooth" nature of the actines of J. eudermis is to be assessed in further detail when more specimens are collected. Order HADROMERIDA Topsent, 1894 Family HEMIASTERELLIDAE Lendenfeld, 1889 Genus Hemiasterella Carter, 1879 Diagnosis. Hemiasterellidae with vasiform, plate-like, flattened branching or massive growth form; choanosomal and peripheral skeletons are loosely organized, vaguely plumoreticulate, without apparent axial compression or differentiation between axial and extra-axial regions. The spicule complement consists of styles and/or oxeas without functional arrangement to any particular part of skeleton and euasters predominantly located in peripheral region of the sponge but not forming a surface crust. The euasters typically show thick, acanthose, strongylote, curved, asymmetrical or branching actines; sometimes calthrop-like, reduced in number to 2–4 actines (sensu Hooper 2002a). Hemiasterella elongata Topsent, 1928 (Figs. 3B, 5; Table 2) Material examined. Four specimens collected: MNCN-Sp66-BV21 from Stn. 21; MNCN-Sp04-DR29 from Stn. 29 m; and MNCN-Sp20-BV33A & B from Stn. 33 (Table 1, Fig. 1). Macroscopic description. Specimens with columnar shape, measuring 5–15 x 4–7 mm (Fig. 3B). The individuals are settled on rock pieces, over which slightly expand their base. The surface shows irregularly shallow folds and grooves, mostly running parallel to the longest body axis. The ectoderm is membrane-like and bears a sparse and uneven hispidation. Pore-like aquiferous openings are visible, especially in the lower half of the body. Color is bright to creamy white both in life and after preservation in ethanol. Skeleton. Megascleres are styles, measuring 1316–2250 x 10–30 µm. They are straight, markedly curved, or just with a slight asymmetrical curvature (Fig. 5A–B). The round end of the styles may also be in a stronglyoxea fashion; the pointing end is regularly acerate or, less frequently, stepped, not very sharp (Fig. 5A–C). Styles with both ends modified into oxea are very rare (e.g., one of 1825 x 10 µm per slide) or absent, depending on the individuals. Microscleres are abundant spherostrongylasters, with only a moderately developed centrum and 10–15 strongylote, slightly conical, spiny actines (Fig. 5A, C–E). Spines are more dense toward the end of the actines. Spherostrongylasters range from 14 to 23 µm in total diameter. FIGURE 5. Hemiasterella elongata Topsent, 1928: (A) Line drawing summarizing the skeletal complement of the Alboranian specimens, consisting of long, isodiametric styles (a) with a round to strongylote end (b) and an acerate or stepped distal end (c), and spiny spherostrongylasters (d). (B) Light microscope view of two differently curved styles. (C) SEM micrograph of a typical round end of a style surrounded by spherostrongylasters. (D–E) SEM details of spherostrongylasters, with spiny actines. The skeletal arrangement shows no axial condensation. Ascending plumose pauci- or multispiculate tracts of styles ramify below the ectosome and may end in plumose tufts that make an hispid surface. There is scarce spongin connecting and packing the spicules in the tracts. Spherostrongylasters are very abundant overall the skeleton, but especially at the periphery, where they make a layer reinforcing the ectosome. Distribution and ecology notes. Rare species, previously known only from its holotype collected at Cape Verde Islands, eastern North Atlantic (Topsent 1928). The herein collected individuals provide the first record of the species for the Mediterranean Sea. All the collected specimens inhabited 93 to 173 m deep, soft bottoms rich in organogenic gravel, occasionally mixed with pieces of dead rhodoliths. Taxonomic remarks. The collected specimens bear overall similarity with the holotype described by Topsent (1928). Nevertheless, some morphological differences occur. The holotype shows two incipient branches, while the Alboranian specimens show no sign of branching. Another difference is that the Alboranian individuals have thinner styles (10–30 µm) than the holotype (25–60 µm). Hemiasterella aristoteliana Voultsiadou-Koukoura & Van Soest, 1991, the only Hemiasterella representative recorded in the Mediterranean previously, occurs in the northern Aegean Sea. Although it has also styles and strongylasters as the only spicule types, the species is clearly distinguishable from H. elongata, because the former has much longer styles (1800–3000 x 18–37 µm) and its asters are commonly reduced to forms with only 1 to 3 actines (Voultsiadou-Koukoura & van Soest 1991). As noted by Topsent (1928), there are some similarities between H. elongata and Hemiasterella vasiformis (Kirkpatrick, 1903) from South Africa. Nevertheless, the latter has a caliculate body shape, many styles becoming tylostyles and strongyles, and a bit larger asters (up to 30 µm of diameter) (Kirkpatrick 1903). Together with the Antarctic Hemiasterella digitata Burton, 1929, H. elongata shows an uncommon shape within the genus, but that of H. digitata is better described as palmo—digitate, with a surface strongly hispid in small patches and neither oscules nor pores visible (Burton 1929). Order HALICHONDRIDA Gray, 1867 Family AXINELLIDAE Carter, 1875 Genus Axinella Schmidt, 1862 Diagnosis. Ramose, bushy or lamellate habit. Surface generally smooth, with choanosomal spicules projecting slightly. Oscules, when visible, with stellate morphology (i.e., superficial canals leading to opening ‘imprinted’ in superficial skeleton). Ectosome without specialized skeleton. Choanosomal skeleton differentiated in axial and extra-axial regions; axial skeleton compressed or vaguely reticulated. Extra-axial skeleton plumose or plumoreticulate. Megascleres styles, or styles and oxeas, or oxeas; when both present, one type may be rare; modifications of megascleres common in several species. Microscleres, if present, microraphides and raphides, mostly in tightly packed trichodragmata (sensu Alvarez & Hooper 2002). Remarks. Recent molecular work based on 18S rRNA, 28S rRNA, and CO1 has suggested that the genus Axinella is polyphyletic, containing at least two major clades (Gazave et al. 2010; Morrow et al. 2012). One of the clades ? the proper "Axinella clade" ? revolves around the type species, Axinella polypoides Schmidt, 1862, while the other, which includes species such as Axinella damicornis (Esper, 1794), Axinella verrucosa (Esper, 1794), and Axinella corrugata (George & Wilson, 1919), shows greater affinities to agelasid sponges than to the A. polypoides clade. The name "Cymbaxinella clade" has been proposed to allude these latter molecular-based group, following the phylocode (Gazave et al. 2010). As no morphological synapomorphies can be found to decide when an "Axinella-like" species should be allocated to the "Cymbaxinella" clade or the "Axinella" clade (Gazave et al. 2010), whenever the molecular information is not available for a species, a serious practical gap rises between the phylocode proposal and the traditional Linnean classification. Subsequent work based on 28S rRNA and CO1 molecular markers has revealed that the "Axinella-like" members of the "Cymbaxinella" clade are closer to encrusting species, such as Hymerhabdia typica Topsent, 1892 (formerly in Bubaridae) and Prosuberites spp. 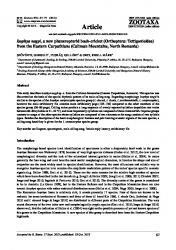 (formerly in Suberitidae), than to Agelas spp. On those arguments, a new family Hymerhabdiidae was erected in the Order Agelasida to assemble together Prosuberites spp., Hymerhabdia spp., those "Axinella" species in the "Cymbaxinella" clade, and some species formerly in the genus Stylissa (Morrow et al. 2012). But again, no morphological clues have been provided to decide in the absence of molecular information when either a newly described or an old, revisited "Axinella-like" species could belong to this new family. Tentatively, Morrow and coworkers (2012) have suggested that "true Axinella" species, such as A. polypoides, have raphides in trichodragmata, while those in the "Cymbaxinella" clade of Agelasida "apparently lack this spicule type". Following this tentative argument, we cannot rule out the possibility that at least one of new species herein described as Axinella but lacking raphides (i.e., Axinella alborana nov. sp.) could be reallocated into another genus in the future if newly collected specimens can ever be analyzed by molecular methods and the emerging molecular clades are finally given taxonomic status. Likewise, this could also be the case of the rare Axinella vellerea Topsent, 1904, which is herein morphologically revisited in detail. Axinella alborana nov. sp. (Figs. 6A–C, 7; Tables 2, 3, 4) Etymology. This species is named after the Alboran Island, where it occurs abundantly. Material examined. Holotype MNCN-Sp155-DR44A from type locality Stn. 44 (Table 1, Fig. 1), a rocky bottom at depths of 135 to 152 m on the Alboran Island shelf. Thirty-three paratypes designated: MNCNSp03DR05A to C from Stn. 5; MNCN-Sp13-DR07A & B from Stn. 7; MNCN-Sp14-BV13A & B from Stn. 13; MNCN-Sp34-BV14A to F from Stn. 14; MNCN-Sp19-DR29A to D from Stn. 29 m; MNCN-Sp146-BV33 A to N from Stn. 33; MNCN-Sp191-BV41 from Stn. 41; and MNCN-Sp155-DR44B from Stn. 44 (Table 1, Fig. 1). Comparative material: Syntype material of Axinella flustra (Topsent, 1892) = Tragosia flustra Topsent, 1892, since no holotype was designated by Topsent (1892) for this species (Table 3). Syntypes were two specimens (MOM-040044) from Bay of Biscay (Stn. 58; 43º40’N 8º55’W, 134 m deep, 7 August 1886) and two specimens (MOM-040272) from Azores (Stn. 247; 38º23.500’N 30º20.333’W, 318 m deep, 30 August 1888). FIGURE 6. (A–B) Holotype of Axinella alborana nov. sp. seen from its both sides (MNCN-Sp155-DR44A). (C) Holotype and 3 additional, collected specimens of A. alborana nov. sp. (from left to right, MNCN-Sp3-DR05A, MNCN-Sp146-BV33A, MNCN-Sp155-DR44A, MNCN-Sp146-BV33B). (D) Specimen of Axinella spatula nov. sp., photographed on board immediately after collection. (E) Preserved specimens of A. spatula nov. sp., being the first (from left to right) the holotype (MNCN-Sp145); the remaining specimens are BV33B, MNCN-Sp116-BV15A & B, and MNCN-Sp65-BV21B. (F–G) Blackish specimens (MNCN-Sp57-BV21A and MNCN-Sp57-BV21B, respectively) of A. spatula nov. sp. The former shows an incipient branching, while the latter is clearly branched and with no narrowing at the stalk. (H–J) Syntypes of Tragosia flustra (Topsent, 1892) collected by Topsent in 1888 (Stn. 247. M. O. M. 040272) and in 1886 (Stn. 58. M. O. M. 040044), respectively. The former (H–I) is shown on its both sides, being profusely ramified, while the latter (J) shows only 3 branches. FIGURE 7. Axinella alborana nov. sp. : (A) Line drawing summarizing the skeletal complement of the Alboranian specimens, consisting of styles (a) and oxeas (b) with acerate, blunt or mucronate ends (c). (B–C) Light microscope view of a style, with examples of the round end. (D–E) Light microscope views of oxeas. Note the varying curving angle, the anisoxea (an) character in some spicules, and the annular swelling (sw) of others. (F) SEM details of oxea ends, being typically either blunt or mucronate. (G) Light microscope view of the skeletal arrangement, showing a style embedded in spongin (s) in the extra-axial skeleton. (H) Light microscope view of oxeas at the extra-axial plumoreticulate skeleton occurring either in paucispicular tracts (pc) or free (sn). Macroscopic description. Erect, stalked, flattened sponge, typically attached to small fragments of rocks or shell fragments (Fig. 6A–C; Table 4). The stalk is either cylindrical or compressed, no longer than one quarter of the total sponge length, and hardly recognizable in some specimens. The flattened part of the body is flexible and relatively rectangular, except for the apical margin of the lamina that may be irregularly lobate. Some specimens show an incipient, terminal ramification; none is markedly divided nor further branched. The sponges measure 10– 28 mm in height, with a lamina up to 19 mm in wideness and 1–2 mm in thickness. The surface is irregularly hispid, with no aquiferous opening discernible. The color ranges from creamy to reddish orange in life, clearing after preservation in ethanol. Skeleton. Megascleres are styles and oxeas (Table 4). Styles are slightly curved at a third of their length (Fig. 7A–B), with a regular round end that occasionally forms one or two slight subtyles and/or annular swellings (Fig. 7C). The pointed end is usually sharp, but rarely blunt ends occur. Styles measure 630–2375 x 5–20 µm, although two specimens showed a low proportion (<1%) of abnormally shorter or longer styles, measuring respectively down to 580 µm and up to 3000 µm in length (Table 1). Oxeas are slightly or markedly fusiform, curved once or twice, either symmetrically or asymmetrically (Fig. 7A, D). Points are usually acerate; anisoxeas are fairly common and variations like mucronate and blunt ends are frequent, depending on the specimen (Fig. 7D). Occasionally they are centrotylote, with annular or subspherical swellings (Fig. 7D) being smooth or rarely rugose. Distribution and ecology notes. The individuals were collected at the deep shelf (87 to 173 m) of the Alboran Island, from rocky, detritic-organogenic gravel, and rhodolith bottoms. Taxonomic remarks. No previously known Axinella spp. in the Atlantic-Mediterranean area have characteristics similar to those of the new species (Table 3). The external morphology of A. alborana nov. sp. bears some external resemblance to A. flustra (Fig. 6H–J), especially to Topsent's (1904) syntypes from Stn. 247 (Fig. 6H–I). Nevertheless, both species strongly differ skeletally, having A. flustra trichodragmata and shorter oxeas (Table 3). Axinella vaceleti Pansini, 1984 is also a flabellate species, but with a marked fan-shaped, undulating lamina, which is also larger (50–60 mm high) and thicker (4–5 mm) than that of the A. alborana nov. sp. specimens. Additionally, A. vaceleti has smaller spicules, specially the styles, ranging from 270 to 1450 µm (Pansini 1984). Specimens of Axinella alborana nov. sp. were investigated for the first time about twenty years ago, as part of a study on the deep-shelf Alboranian sponges carried out by Maldonado (1993). Nevertheless, no description of material was published at that time because of the risk that the small individuals now described as A. alborana nov. sp. might correspond to juvenile stages of some poorly known, large Axinella spp. growing at the ill-known deep shelf. However, our recent exploration of those deep-shelf habitats using an ROV has revealed that there is no dense population of any other large Axinella spp. in the areas where A. alborana nov. sp. occurs. In the light of these findings, the idea that the dense undergrowth of small individuals might correspond to juvenile sponges makes no sense and these small sponges can indeed be identified as adults of A. alborana nov. sp. Axinella spatula nov. sp. (Figs. 6D–G, 8; tables 2, 3, 5) Etymology. The species is named after the "spatula" tool (a diminutive form of the Latin "spatha"), which bears resemblance to the external shape of the specimens. Material examined. Holotype MNCN-Sp145-BV33B collected from type locality Stn. 33 (Table 1, Fig. 1), a 134 to 173 m deep, gravel bottom at the deep shelf of the Alboran Island. FIGURE 8. Axinella spatula nov. sp. : (A) Line drawing summarizing the skeletal complement of the Alboranian specimens. It consists of styles (a) in a wide range of sizes, with a round end that occasionally shows one or more swellings (b) and a distal end that can be acerate, stepped or blunt (c). Oxeas of varying shape (d), with acerate to mucronate ends (e). Raphides (f) are in trichodragmata. (B–C) Light microscope views of styles and trichodragmata (tr). (D) Light microscope view of oxeas. (E) SEM micrograph of the flattened trichodragmata typically found in the beige specimens (e.g., in MNCN-Sp65-BV21A). (F) SEM micrograph of a more cylindrical trichodragmata typically found in blackish specimens (e.g., in MNCN-Sp57-BV21A). (G) Detail of the plumoreticulate and somewhat irregular skeletal arrangement at the lamina region of the sponge. Note the spongin (s) is embedding the paucispicular tracts (pc). Twenty-two paratypes designated: MNCN-Sp28-BV14A to C from Stn. 14; MNCN-Sp116-BV15A to I from Stn.15; MNCN-Sp57-BV21A to C (blackish specimens) and MNCN-Sp65-BV21A & B from Stn. 21; MNCNSp145-BV33A & C to D from Stn. 33; MNCN-Sp188-BV41A & B from Stn. 41 (Table 1, Fig. 1). Comparative material: Syntype material of Axinella flustra (Topsent, 1892) = Tragosia flustra Topsent, 1892, since no holotype was designated by Topsent (1892) for this species (Table 3). Syntypes were two specimens (MOM-040044) from Bay of Biscay (Stn. 58; 43º40’N 8º55’W, 134 m deep, 7 August 1886) and two specimens (MOM-040272) from Azores (Stn. 247; 38º23.500’N 30º20.333’W, 318 m deep, 30 August 1888). Macroscopic description. Erect, flabellate sponges (Fig. 6E–G; Table 5). They are 35–100 mm in height, with a basal stalk-like region in which the lamina progressively increases in wideness from the attachment point up to about 1/4 of the height, where it becomes approximately rectangular (3–9 mm in wideness). The lamina is thin (1– 1.5 mm) and flexuous. It can be undivided, or, in some individuals, forming two or three flattened branches, all with a regular apical margin (Fig. 6E). The sponge surface is porous to the dissecting microscope, largely and irregularly hispid. Most collected individuals are pale orange when alive, turning into yellowish white to beige after ethanol preservation. Nevertheless, three of the specimens show remarkable color dissimilarity, being dark brown to black, at least after preservation in ethanol (Fig. 6F–G). Some of these blackish specimens (part of the paratype series) also account for the largest sizes (up to100 mm in height) and have the stalk-like region more flattened than the orange-beige individuals. higher frequencies of short styles in the orange-beige specimens. Even though we are herein assuming that these differences correspond to ill-known aspects of intraspecific variation, we cannot discard that future studies based on molecular features of new collections and/or "in vivo" observations may led to a species split. Trichodragmata similar to those in A. spatula nov. sp. are also found in some other Axinella spp. (Table 3), such as Axinella infundibuliformis (Linnaeus, 1759). Nevertheless, this latter species has a caliculate or fan-like body shape, a plumoreticulate skeleton of oxeas and styles clearly smaller (300–600 x 12–16 µm), as well as smaller (15–20 µm long) trichodragmata (Lendenfeld 1897; Arndt et al. 1935). It is also worth noting that the earliest descriptions of A. infundibuliformis were little accurate and apparently overlooked the small trichodragmata (Johnston 1842; Bowerbank 1866; Hansen et al. 1885; Fristedt 1887). Axinella alba (Descatoire, 1966) also shows trichodragmata, but it is an encrusting species and has oxeas (700–1000 x 15–18 µm) longer than those of A. spatula nov. sp. Trichodramata and styles also occur in Axinella flustra (Descatoire 1966), but, again, although these styles and trichodragmata are in a size range similar to those of A. spatula nov. sp., the branching body shape (Fig. 6H–J) and shorter oxeas make A. flustra easily distinguishable (Table 3). Some members of the axinellid genus Dragmacidon Hallman, 1917 (Table 3) bear some vague resemblance to A. spatula nov. sp., namely occurrence of raphides and the absence of a clear axial and extra-axial skeleton differentiation. Furthermore, phylogenetic analyses based on 18SrRNA, 28S rRNA and CO1 have brought Dragamacidon species and raphide-bearing Axinella species into a same clade (Gazave et al. 2010; Morrow et al. 2012). Dragmacidon tuberosum (Topsent, 1928) is the only geographically close species in the genus having trichodragmata, but those are distinctive, having the raphides projecting from each side of the packets; besides, this species has shorter styles (Topsent 1928). gravel bottom at Azores (Topsent 1904), and one from 200–290 m depths at the Folden fiord of the Norwegian Sea (Burton 1931). Taxonomic remarks. The size of the examined syntypes of A. vellerea (97 x 40 mm and 45 x 18 mm) is slightly larger than that of any of the Alboranian individuals, being the remaining aspects of the external morphology notably similar between both specimen groups (Fig. 9A–H). The largest syntype also shows two branches better developed (Fig. 9F–G) than the incipient branches often characterizing the Alboranian individuals (Fig. 9A–E). Regarding the spicules, the Alboranian specimens and the syntypes of A. vellerea show styles in nearly identical size and shape ranges (Table 3). A small skeletal difference is that oxeas are not found in neither the original description by Topsent (1904) nor in our re-examination of the syntypes. Burton (1931) did report occasional "oxeote styles" in his Norwegian specimen. In the Alboranian, specimens, we found oxeas in only a minority of individuals and always in low abundance. Therefore, the oxeas appear to be a variable element in the spicule complement of A. vellerea, as it is also the case of other Axinella spp. As previously noticed by Topsent (1904), A. vellerea and Axinella vasonuda Topsent, 1904 bear similarity in both their external morphology and the skeletal organization. Nevertheless, A. vasonuda is characterized by having oxeas as main spicule type, showing only scarce styles, the occurrence of which is limited to the peripheral zones of the skeleton. FIGURE 9.Axinella vellerea Topsent, 1904. (A–B) One of the collected Alboranian specimens (MNCN-Sp51-DR05A) shown on its both sides and bearing an incipient branching. (C) A branchless Alboranian specimen (MNCN-SP51-DR05B) of A. vellerea photographed on graphic paper. (D-E) Another unbranched Alboranian specimen (MNCN-Sp142-DR44A) attached to a piece of gravel, shown on its both sides. (F) Photograph of the holotype (the large sponge to the right) and the syntype (to the left) of A. vellerea, collected by Topsent in 1897 (Stn. 866. M. O. M. 040631). (G) Close up of the holotype of A. vellerea, being clearly ramified and larger than most specimens collected from the Alboran Island. (H) Close up of the syntype of A. vellerea, showing an incipient branch. FIGURE 10. Axinella vellerea Topsent, 1904: (A) Line drawing summarizing the skeletal complement of the Alboranian specimens. Styles (a) are in a wide variety of shapes, with a round end that can be regular or showing one or more swellings (b) and a distal end (c) that can be regular to blunt, sometimes with mucronate variations. Oxeas (d) occur in varying size and shapes, with ends ranging from acerate to mucronate (e). (B) Light microscope view of a style with a subtylote end. (C) SEM detail of three typical morphologies (i.e., subterminal ring, subtylote, and regular) of the round end of styles. (D) Light microscope view of a double-bent oxea. (E) Light microscope view of plumose arrangement in the extra-axial skeleton. (F) Detail of styles embedded by spongin (s). Family BUBARIDAE Topsent, 1894 Genus Rhabdobaris Pulitzer-Finali, 1983 Diagnosis. Monotypic genus of Bubaridae, characterized by stalked and flabellate body shape, possessing long hispidating styles and a plumoreticulate internal skeleton made of choanosomal rhabdostyles, oxeas, and strongyles, with smooth and spiny forms co-occurring. 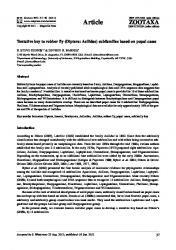 Microscleres are raphides in trichodragmata (genus diagnosis herein redefined after Rhabdobaris being restituted as a valid genus; not a junior synonym of Cerbaris Topsent, 1898). Remarks. See the "Taxonomic remarks" section of Rhabdobaris implicata for further discussion and concerns about the morphological affinity of the herein restituted genus Rhabdobaris and members of the family Raspailiidae. Rhabdobaris implicata Pulitzer-Finali, 1983 (Figs. 11A–B, 12; Table 2) Synonymy. Cerbaris implicatus (Pulitzer-Finali, 1983): Alvarez & Van Soest 2002, 751–752. FIGURE 11. (A–B) Neotype (MNCN-Sp23-BV14) of Rhabdobaris implicata Pulitzer-Finali, 1983 collected from the Alboran Island and photographed on its both sides. Note some ribs (r) on the lamina. (C–D) Holotype of Endectyon (Hemectyon) filiformis nov. sp. (MNCN-Sp69 BV21) attached on a small piece of gravel, photographed on its both sides. FIGURE 12. Rhabdobaris implicata Pulitzer-Finali, 1983: (A) Line drawing summarizing the skeletal complement of the Alboranian specimen (MNCN-Sp23-BV14), consisting of hispidating styles (a), smooth rhabdostyles (b) with a regular or swollen round end (c) and acerate, bifid to polyactinal, or stepped distal end (d), acanthostyles (e), small styles (f), smooth oxeas (g) with acerate, stepped, mucronate or polyactinal ends (h), acanthoxeas (i), developing stages of oxeas (j), strongyles (k), acanthostrongyles (l), and toxiform raphides in trichodragmata (m). (B–D) Light microscope views of an hispidating style (B) and choanosomal rhabdostyles (C), sometimes with abnormal, polyactinal points (po). (D) SEM view of an acanthostyle. (E) Light microscope view of oxeas in various shapes, sometimes showing polyactinal ends (po). (F) SEM micrograph of an acanthoxea. (G) Light microscope view of an acanthostrongyle of the holotype Rhabdobaris implicata Pulitzer-Finali, 1983 (MSNG-47170). (H) SEM image of two overlapped trichodragmata of toxiform raphides in the Alboranian specimen. characterized by encrusting sponges, with a choanosomal skeleton consisting of a basal layer of acanthose and smooth diactines and monactines projecting perpendicularly to the substratum. Therefore, the current diagnosis of Cerbaris reflects several major mismatches relative to the features of Rhabdobaris implicata: 1) R. implicata is a stalked, flabellate sponge (Fig. 11A–B), rather than an encrusting form; 2) the skeleton is not a basal layer, but consists of a plumoreticulate structure of ascending tracts; 3) it lacks the distinct ceroxas (M-shaped oxeas) of Cerbaris; 4) Rhabdobaris implicata has acanthostyles in great abundance, a spicule type often missing in Cerbaris. Altogether, the differences in body shape, spicule complement and skeletal organization advice to re-establish the original genus Rhabdobaris erected by Pulitzler-Finali (1983) in the family Bubaridae. Likewise, the existence of Rhabdobaris makes compulsory a modification of the current definition for family Bubaridae, as it is currently defined by Alvarez & Van Soest (2002) only to host sponges with an encrusting growth habit supported by a basal layer of interlacing choanosomal diactines. A comparison of the spicule complement of our Alboranian specimen to Cerbaris spp. occurring in or near the Western Mediterranean region reveals only vague resemblance to Cerbaris (formerly Bubaropsis) curvisclera (Lévi & Vacelet 1958) from Azores and Cerbaris (formerly Rhabdoploca) curvispiculifer (Carter 1880), originally described from the Indian Ocean (Gulf of Manaar) and subsequently found in Azores (Topsent 1904) and Banyuls (Vacelet 1969). These two latter Cerbaris species are encrusting forms that also lack the plumoreticulate skeleton. In addition, C. curvispiculifer lacks raphides, having a spicule complement that varies across described specimens. For instance, it lacks both smooth and acanthose oxeas in the Indian and North-Atlantic specimens, but not in the Mediterranean material. Cerbaris curvisclera has raphides and smooth oxeas, but lacks any kind of style or acanthostyle. Therefore, R. implicata is clearly distinguishable from these Cerbaris species. Although the genus Rhabdobaris is herein restituted within the original family in which it was erected, that is Bubaridae, there are concerns that Rhabdobaris could be a raspailiid. Indeed, the body shape, the spicule complement, and the general skeletal organization match better the traits characterizing the family Raspailiidae than those of the family Bubaridae. Nevertheless, Rhabdobaris lacks the hispidating bouquets around the long hispidating styles, which typically characterize most—but not all—raspailiids. Therefore, a definitive family assignation may require further inference of the phylogenetic relationships of Rhabdobaris using molecular markers. Order POECILOSCLERIDA Topsent, 1928 Suborder MIICROCIONINA Hajdu, van Soest & Hooper, 1994 Family RASPAILIIDAE Nardo, 1833 Subfamily RASPAILIINAE Nardo, 1833 Genus Endectyon Topsent, 1920 Diagnosis. Prominently hispid, conulose surface, and typically arborescent growth form. Skeleton with marked axial and extra-axial differentiation; axial skeleton with well-developed spongin fibres forming a compressed reticulation, cored by stout choanosomal styles; extra-axial subectosomal skeleton being radial or plumose, with multi- or paucispicular tracts of long subectosomal styles (subgenus Endectyon) or choanosomal styles (subgenus Hemectyon), sometimes connected by unispicular tracts forming hexagonal meshes, usually protruding the surface. Ectosomal skeleton varies from typical raspailiid condition, with thin ectosomal styles grouped in brushes around protruding subectosomal styles (subgenus Endectyon), to surface brushes composed of subectosomal styles only (nominal genus Basiectyon), to brushes of acanthostyles surrounding choanosomal styles (subgenus Hemectyon). Erect brushes of echinating acanthostyles located on the outer margin of the axial skeleton, making a boundary between the extra-axial and axial regions, or forming plumose brushes along the length of the extra-axial tracts, or localized exclusively at the base of the sponge (nominal genus Basiectyon). Structural megascleres are smooth styles of 2–3 size categories, along with echinating acanthostyles and/or acanthostrongyles with peculiar strongly curved (clavulate) hooks on the shaft, base, and/or apex. Microscleres are absent (sensu Hooper 2002b). Subgenus Hemectyon Topsent, 1920 Diagnosis. Erect, probably undivided (see "Taxonomic Remarks"), growth form. Skeletal organization with recognizable axial, extra-axial and ectosomal regions. Axial skeleton of multispiculate-cored fibres densely reticulated. Extra-axial skeleton consisting of a more lax reticulum of pauci- to multispicular radiating primary tracts intercrossed by uni- to paucispicular secondary tracts. Spongin fibres and tracts of the axial and extra-axial regions are cored by smooth choanosomal styles; the radiating primary tracts of the extra-axial skeleton may be sparsely echinated by acanthostyles, particularly in their subectosomal regions. In the subectosomal region, the peripheral nodes of the extra-axial network serve as basis for small bouquets of longer (subectosomal) styles, which pierce the sponge ectosome to make a long, dense hispidation. At the point where each of these protruding bouquets of styles pierce the sponge ectosome, a surrounding brush consisting mostly of acanthostyles (but also incorporating some choanosomal styles) occurs, being this skeletal trait a distinct character for the subgenus Hemectyon (modified herein to accommodate the features of the new species). FIGURE 13. Endectyon (Hemectyon) filiformis nov. sp. : (A) Line drawing summarizing the spicule complement of the holotype (MNCN-Sp69-BV21). There are subectosomal styles (a) with a round end and an acerate or hastate distal end (b) and choanosomal styles with a regular or swollen round end (d) and an acerate, hastate or polyaxonic distal end (e). There are also oxeas (f) with conical to hastate ends (g) and acanthostyles (h) with large spines that can be clavulate at the round end (i). (B) Light microscope view of choanosomal styles, with slight subterminal swelling (bs) or a subtle subtyle (sb). (C) Light microscope view of an oxea. (D) SEM micrographs of acanthostyles. (E) Line drawing sketching the organization of the ectosomal skeleton, which consists of the subectosomal styles (es) surrounded by an hispidating brush of acanthostyles (as). (F) Light microscope view of the choanosomal skeleton where spongin (s) can be observed embedding the choanosomal styles. The occurrence of acanthostyle brushes surrounding the groups of hispidating styles clearly indicates that the newly described Alboranian material belongs to the subgenus Hemectyon, making the second known species in this subgenus. The differences between E. (H.) hamatum and E. (H.) filifomis nov. sp. are clear: 1) the axial and extraaxial differentiation is less marked in the new species, as well as the differentiation between radiating primary tracts and secondary intercrossing tracts; 2) the primary radiating tracts are only very rarely echinated by the acanthostyles in the new species; 3) the acanthostyles do not have clavulate spines at the round end in E. (H.) hamatum, but they do have them in the new species; 4) The hispidating styles in E. (H.) hamatum are relatively small (220–275 x 2 µm) and shorter than those coring the choanosomal fibres and tracts (270–615 x 6–18 µm), whereas they are notably longer (up to 1465 x 20 µm ) in the new species; and 5) the new species contains occasional oxeas, while they do not occur in E. (H.) hamatum. Indeed, oxeas are an uncommon spicule type in Endectyon spp., although occasional modifications of styles into oxeas and strongyles have already been recorded in Endectyon (Endectyon) tenax (Schmidt, 1870) from North Carolina by Wells et al. 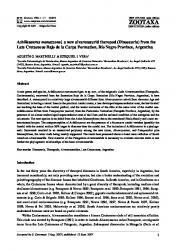 (1960) and Endectyon (Endectyon) multidentatum (Burton, 1948) from Congo Coast (Burton 1948). To accommodate the skeletal features of this new species, it has been necessary to modify herein the last accepted diagnosis of subgenus Hemectyon, which was proposed by Hooper (2002b) on the basis of the only species available at that time. An additional reason to revise the subgenus diagnosis is the growth habit. Originally, Hemectyon was erected on a partial sponge fragment that was assumed to be part of a larger, branched individual (Schmidt 1870; Topsent 1920). Ever since, the successive genus diagnoses have included terms such as "rameuse" (Topsent 1920) or "arborescent" (Hooper 2002b), a branching condition that has never been corroborated objectively. Given that the holotype of E. (H.) hamatum is an undivided cylindrical fragment (23mm x 3.5) and that the complete holotype of E. (H.) filiformis nov. sp. is also an undivided, digit-like growth form, there is no reason to support any longer that the sponges of the subgenus Hemectyon are arboresecent. Rather, they should be postulated as erect, branchless growth forms, at least until future collections of new material disprove it. Order HAPLOSCLERIDA Topsent, 1928 Suborder HAPLOSCLERINA Topsent, 1928 Family NIPHATIDAE Van Soest, 1980 Genus Gelliodes Ridley, 1884 Diagnosis. Thickly incrusting to massive, tubular growth form, intricately branching, long cylindrical stems irregularly ramified and anastomosing at points of contact (single branches attain a length of about 100 mm), rampant or erect, arising from a common basal portion. Oscules usually numerous, unevenly scattered over the surface and often conspicuous. Surface uneven, membranous, strongly aculeated at intervals of about 2–5mm, sustained by strong, slender, sharp ramified spines, 2–3 mm long surface may be also ridged or tuberculate or smooth, and finely hispid or velvety. Texture very hard. Ectosomal skeleton is a tangential network of secondary fibres, free oxeas and abundant sigmas, often interrupted by the ends of the strong primary longitudinal fibres protruding from the choanosomal skeleton to form the spines. Choanosomal skeleton composed of primary longitudinal-radial multispicular and ramified primary fibres, distinct and very compact. Primary fibres form rectangular to rounded meshes, subdivided irregularly by secondary fibres, and mesh containing abundant free spicules. Megascleres consist of robust oxeas with sharp apices. Microscleres are abundant sigmata (sensu Desqueyroux-Fáundez & Valentine 2002). Gelliodes fayalensis Topsent, 1892 (Figs. 14, 15; Table 2) Synonymy. Adocia fayalensis (Topsent, 1892): (Burton 1956,)145. Material examined. Specimen MNCN-Sp137 DR07 collected from Stn. 7 (Table 1, Fig. 1). Macroscopic description. Ovate, cushion-shaped sponge, attached to a small piece of rhodolith (Fig. 14A–B). It measures 30 x 20 mm and is fouled around its basal region by a thickly encrusting individual of Haliclona sp. Surface is smooth, consisting of a thin, delicate, translucent membrane. The ectosomal membrane is damaged in many areas of the body, showing a highly cavernous subectosomal tissue. Ectosome damage makes difficult to discriminate the occurrence of oscules from ectosome breakages. The consistency is hard but friable. The color in alcohol is beige. Skeleton. Megascleres are oxeas in a size range that could well represent two categories. The oxeas in the large category measure 280–400 x 10–15 µm and are slightly curved, typically showing two flexion points (Fig. 15A–B, E). The ends are acerate, with occasional malformations (Fig. 15A, C). The oxeas in the small category are less abundant, measure 200–270 x 2–5 µm, are regularly curved over their entire length (Fig. 15A, D–E), and have relatively regular hastate ends (Fig. 15A). Nevertheless, we cannot discard that the smaller oxeas are early developing stages of the larger oxeas. Microscleres are abundant sigmata, 15–27 µm in maximum length (Fig. 15A, E–F). FIGURE 14. Gelliodes fayalensis Topsent, 1892. Specimen from the Alboran Island (MNCN-Sp137-DR07), photographed on its both sides while attached to a rhodolith fragment. The ectosomal skeleton is a reticule of tangential oxeas made of uni- or paucispicular lines. The choanosomal skeleton is an irregular network (Fig. 15G) consisting of compact, primary multispicular tracts of oxeas with moderate spongin (Fig. 15H), which branch and subdivide when running from the deep choanosome towards the periphery. Primary tracts are 250–625 µm wide and connect each other by secondary, pauci- or multispicular secondary tracts, which are 125–200 µm wide. Microscleres are abundant at the subectosomal region, also occurring in the choanosome, some partially embedded in the oxea tracts. Distribution and ecology notes. Rare species, known from the original description of 5 individuals from Azores (Topsent 1892, 1904), all coming from the Fayal Channel (Azores), growing on gravel bottoms rich in organogenic elements, at depths of 98–100 m. The herein described Alboranian specimen, collected from a rhodolith bottom at depths ranging from 109 and 130 m, provides the first record of the species in the Mediterranean Sea. Taxonomic remarks. The spicule complement, the spicule size, and the skeletal organization of the Alboranian individual are strongly similar to those of Gelliodes fayalensis Topsent, 1892. A minor difference is that Topsent (1892) did not split the oxeas of G. fayalensis into two size categories. Nevertheless, we are not completely certain that the smaller oxeas that we are herein describing are a size category themselves; they could rather be early growth stages. The only size data for oxeas in Topsent's description (1892) is 270 x 9 µm, which approximately represents the median of the size range found in the oxeas of the Alboran specimen. All specimens described from Azores by Topsent (1892, 1904) were reported to have several distinct oscules. The preservation condition of our Alboranian specimen did prevent us to discriminate oscules from the frequent ectosomal breakages and, indeed, hindered a relevant comparison in terms of external morphology features. FIGURE 15. Gelliodes fayalensis Topsent, 1892: (A) Line drawing summarizing the spicule complement of the Alboranian specimen (MNCN-Sp137-DR07), consisting of fusiform oxeas I (a) with acerate to malformed ends (b), isodiametric oxeas II (c) with acerate ends (d), and sigmata (e). (B) Light microscope view of Oxea I. (C) SEM detail of regular and abnormal ends of oxea I. (D) Light microscope view of isodiametric Oxea II. (E) SEM view oxeas I and II and a sigma. (F) SEM detail of a sigma. (G) Light microscope view of multispiculate tracts of oxeas I and II forming a network. (H) Light microscope detail of a multispiculate tract. Acknowledgments The authors thank Dr. Serge Gofas (University of Malaga), Dr. Carmen Salas (University of Malaga), Dr. Ángel Luque (Autonomous University of Madrid) and Juan Goutayer for organizing the logistic of collecting and ROV cruises and providing help with bathymetric maps, community maps, and video material. Scientists and technicians participating in the cruise, along with crewmembers and ROV crew, are thanked for their help on board. Gustavo Carreras (CEAB) helped with line drawings and María J. Carbonell (CEAB) assisted with SEM observations. Dr. Isabelle Domart-Coulon (Muséum national d’Histoire naturelle, Paris), Dr. Maria Tavano (Museo Civico di Storia Naturale Giacomo Doria di Genoa, Genoa, Italy), and Michèle Bruni (Musée océanographique de Monaco, Monaco) are thanked for the loan of comparative materials. Dr. Maurizio Pansini kindly provided information on Axinella vaceleti Pansini, 1984 and Dr. Rob Van Soest did so on Axinella pumila Babic, 1922. Dr. S. Gofas, Dr. A. Luque, Dr. Jose Templado (MNCN), Dr. Christine Morrow (National Museums Northern Ireland), Dr. Bernard Picton (National Museums Northern Ireland), and two anonymous reviewers provided useful, constructive comments on draft stages of the manuscript. This research has benefited from funds of a European Community grant LIFE+ Indemares (through the Fundación Biodiversidad Project 46P.PR9999), an Intramural CSIC Research Grant (PIE, PN-2013), and a grant of Spanish Ministry of Economy and Competitiveness (CTM2012-37787). References Aguilar, R., Aksissou, M., Templado, J. & Romani, M. (2011) Scientific rationale for the proposed CIESM Near Atlantic Marine Peace Park - A CIESM proposal. In: Briand, F. (Ed. ), Marine peace parks in the Mediterranean. CIESM, Monaco, pp. 43–49. Alvarez, B. & Hooper, J.N.A. (2002) Family Axinellidae Carter, 1875. In: Hooper, J.N.A. & Van Soest, R.W.M. (Eds. ), Systema Porifera: A guide to the classification of sponges. Kluwer Academic/Plenum Publishers, New York, pp. 724–747. Alvarez, B. & Van Soest, R.W.M. (2002) Family Bubaridae Topsent, 1894. In: Hooper, J.N.A. & Van Soest, R.W.M. (Eds. ), Systema Porifera. A guide to the classification of sponges. Kluwer Academic/ Plenum Publishers, New York, pp. 748–754. Arndt, W., Grimpie & Wagler. (1935) Porifera. Die Tierwelt der Nord-und Ostsee. Berlin, 140 pp. Babic, K. (1922) Monactinellida und Tetractinellida des Adriatischen Meeres. Zoologische Jahrbücher, Abt. Systematik, 46, 217–302. Bertolino, M., Bo, M., Canese, S., Bavestrello, G. & Pansini, M. (2013a) Deep sponge communities of the Gulf of St Eufemia (Calabria, southern Tyrrhenian Sea), with description of two new species. Journal of the Marine Biological Association of the United Kingdom, FirstView, 1–17. Bertolino, M., Cerrano, C., Bavestrello, G., Carella, M., Pansini, M. & Calcinai, B. 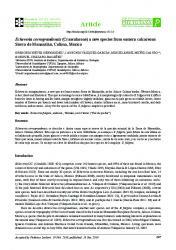 (2013b) Diversity of Porifera in the Mediterranean coralligenous accretions, with description of a new species. ZooKeys, 336, 1–37. http://dx.doi.org/10.3897/zookeys.336.5139 Boury-Esnault, N., Pansini, M. & Uriz, M.J. (1994) Spongiaires bathyaux de la mer d'Alboran et du golfe ibéro-marocain. Mémoires. Muséum National d'Histoire Naturelle, 160, 1–174. Boury-Esnault, N. & Rützler, K. (1997) Thesaurus of sponge morphology. Smithsonian Contributions to Zoology, 596, 1–55. http://dx.doi.org/10.5479/si.00810282.596 Bowerbank, J.S. (1866) A monograph of the British Spongiadae. II. Synopsis of Genera. Ray Society of London, London, 388 pp. Burton, M. (1929) Porifera. Part II. Antarctic Sponges. British Antarctic Terra Nova Expedition. 1910-1913, Zool., 6, 393–458. Burton, M. (1931) The Folden Fiord. Report on the sponges collected by Mr. Soot-Ryven in the Folden Fiord in the year 1923. Tromsø Museum Skrifter, 1, 1–8. Burton, M. (1948) Marine sponges of Congo coast. Institut Royal Colonial Belge Bulletin des Séances 19, 753–758. Burton, M. (1956) The Sponges of West Africa. Atlantide Report. Scientific Results of the Danish Expedition to the Coasts of Tropical West Africa, 1945-1946, 4, 111–147. Calcinai, B., Moratti, V., Martinelli, M., Bavestrello, G. & Taviani, M. (2013) Uncommon sponges associated with deep coral bank and maerl habitats in the Strait of Sicily (Mediterranean Sea). 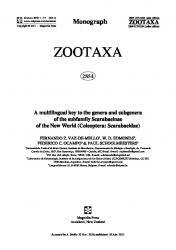 Italian Journal of Zoology, 80, 412–423. http://dx.doi.org/10.1080/11250003.2013.786763 Carter, H.J. (1880) Report on Specimens dredged up from the Gulf of Manaar and presented to the Liverpool Free Museum by Capt. W. H. Cawne Warren. Annals and Magazine of Natural History, 5–6, 437–457, 35–61, 126–156. Coll, M., Piroddi, C., Steenbeek, J., Kaschner, K., Ben Rais Lasram, F., Aguzzi, J., Ballesteros, E., Bianchi, C.N., Corbera, J., Dailianis, T., Danovaro, R., Estrada, M., Froglia, C., Galil, B.S., Gasol, J.M., Gertwagen, R., Gil, J., Guilhaumon, F., Kesner-Reyes, K., Kitsos, M.-S., Koukouras, A., Lampadariou, N., Laxamana, E., López-Fé de la Cuadra, C.M., Lotze, H.K., Martin, D., Mouillot, D., Oro, D., Raicevich, S., Rius-Barile, J., Saiz-Salinas, J.I., San Vicente, C., Somot, S., Templado, J., Turon, X., Vafidis, D., Villanueva, R. & Voultsiadou, E. (2010) The biodiversity of the Mediterranean Sea: Estimates, patterns, and threats. PLoS One, 5, e11842. http://dx.doi.org/10.1371/journal.pone.0011842 Comas, M.C., García-Dueñas, V. & Jurado, M.J. (1992) Neogene tectonic evolution of the Alboran Sea. Geo-Marine Letters, 12, 157–164. http://dx.doi.org/10.1007/bf02084927 Descatoire, A. (1966) Sur quelques Démosponges de l'Archipel de Glénan. Cahiers de Biologie Marine, 7, 231–246. Desqueyroux-Fáundez, R. & Valentine, C.A. (2002) Family Niphatidae Van Soest, 1980. In: Hooper, J.N.A. & Van Soest, R.W.M. (Eds. ), Systema Porifera. A guide to the classification of sponges. Kluwer Academic/ Plenum New York, pp. 874–890. Fristedt, K. (1887) Sponges from the Atlantic and Arctic Oceans and the Behring Sea. Vega-Expeditionens Vetenskap. Iakttagelser (Nordenskiöld), 4, 401–471. Gazave, E., Carteron, S., Chenuil, A., Richelle-Maurer, E., Boury-Esnault, N. & Borchiellini, C. (2010) Polyphyly of the genus Axinella and of the family Axinellidae (Porifera: Demospongiaep). Molecular Phylogenetics and Evolution, 57, 35–47. http://dx.doi.org/10.1016/j.ympev.2010.05.028 Hansen, G.A., Grondal & Sons, B. (1885) Spongiadae. Den Norske Nordhavs-Expedition 1876-1878. Grondal & Sons Bogtrykkeri, Christiania, 25 pp. Hogg, M.M., Tendal, O.S., Conway, K.W., Pomponi, S.A., van Soest, R.W.M., Gutt, J., Krautter, M. & Roberts, J.M. (2010) Deep-sea sponge grounds: Reservoirs of biodiversity. UNEP-WCMC, Cambridge, 84 pp. Hooper, J.N.A. (1991) Revision of the Family Raspailiidae (Porifera: Demospongiae), with Description of Australian Species. Invertebrate Taxonomy, 5, 1179–1418. http://dx.doi.org/10.1071/it9911179 Hooper, J.N.A. (2002a) Family Hemiasterellidae Lendenfeld, 1889. In: Hooper, J.N.A. & Van Soest, R.W.M. (Eds. ), Systema Porifera: a guide to the classification of sponges. Kluwer Academic/Plenum Publishers, New York, pp. 186–195. Hooper, J.N.A. (2002b) Family Raspailiidae Hentschel, 1923. In: Hooper, J.N.A. & Van Soest, R.W.M. (Eds. ), Systema Porifera. Guide to the classification of sponges. Kluwer Academic/ Plenum New York, pp. 469–510. Johnston, G. (1842) A history of British sponges and lithophytes. W.H. Lizars, Edinburgh, 1–264 pp. Kirkpatrick, R. (1903) Descriptions of South African sponges. Part III. Marine Investigations in South Africa, 2, 233–261. Lendenfeld, R.V. (1897) On the Spongida. Notes on Rockall Island and Banks. Transactions of the Royal Irish Academy, 31, 82–88. Lévi, C. (1957) Spongiaires des côtes d'Israel. Bulletin of the Research Council of Israel, 6 B, 201–212. Lévi, C. & Vacelet, J. (1958) Eponges récoltées dans l'Atlantique Oriental par le "President Theodore Tissier" (1955-1956). Revue des Travaux de l'Institut des Pêches Maritimes, 22, 225–246. Maldonado, M. (1992) Demosponges of the red coral bottoms from the Alboran Sea. Journal of Natural History, 26, 1131– 1161. http://dx.doi.org/10.1080/00222939200770661 Maldonado, M. (1993) Demosponjas litorales de Alborán. Faunística y Biogeografía, Ph.D. University of Barcelona, Barcelona, 496 pp. Maldonado, M. (2006) The ecology of the sponge larva. Canadian Journal of Zoology (Journal Canadien de Zoologie), 84, 175–194. Maldonado, M. & Benito, J. (1991) Crambe tuberosa n. sp. (Demospongiae, Poecilosclerida): a new Mediterranean poecilosclerid with lithistid affinities. Cahiers de Biologie Marine, 32, 323–332. Maldonado, M. & Uriz, J.M. (1995) Biotoic affinities in a transitional zone between the Atlantic and the Mediterranean: a biogeographical approach based on sponges. Journal of Biogeography, 22, 89–110. Maldonado, M. & Uriz, M.J. (1996) A new species of Sphinctrella (Demospongiae: Astrophorida) and remarks on the status of the genus in the Mediterranean. Bulletin de l'Institut Royal des Sciences Naturelles de Belgique, 66 suppl., 175–184. Maldonado, M. & Uriz, M.J. (1999) A new dendroceratid sponge with reticulate skeleton. Memoirs of the Queensland Museum, 44, 353–359. Martínez-García, P., Soto, J.I. & Comas, M. (2010) Structural analysis and recent tectonics in the central Alboran Sea. Trabajos de Geología, Universidad de Oviedo, 30, 44–48. Morrow, C.C., Picton, B.E., Erpenbeck, D., Boury-Esnault, N., Maggs, C.A. & Allcock, A.L. (2012) Congruence between nuclear and mitochondrial genes in Demospongiae: A new hypothesis for relationships within the G4 clade (Porifera: Demospongiae). Molecular Phylogenetics and Evolution, 62, 174–190. http://dx.doi.org/10.1016/j.ympev.2011.09.016 Pansini, M. (1984) Notes on some Mediterranean Axinella with description of two new species. Bollettino dei Musei e degli Istituti Biologici della Università di Genova, 50 (51), 79–98. Pansini, M., Vacelet, J. & Boury-Esnault, N. (1987) Littoral demosponges from the banks of the straits of Sicily and the Alboran Sea. In: Taxonomy of Porifera. Springer Verlag, Berlin, Heidelberg, pp. 149–186. Pardo, E., Aguilar, R., García, S., de la Torriente, A. & Ubero, J. (2011) Documentación de arrecifes de corales de agua fría en el Mediterráneo occidental (Mar de Alborán). Chronica Naturae, 1, 20–34. Péres, J.M. & Picard, J. (1964) Nouveau manuel de bionomie benthique de la mer Méditerranée. Recueil des Travaux de la Station Marine d'Endoume, 31, 1–137. Pulitzer-Finali, G. (1983) A collection of Mediterranean Demospongiae (Porifera) with, in appendix, a list of the Demospongiae hitherto recorded from the Mediterranean Sea. Annali del Museo Civico di Storia Naturale Giacomo Doria, 84, 445–621. Pulitzer-Finali, G. (1993) A collection of marine sponges from East Africa. Annali del Museo Civico di Storia Naturale Giacomo Doria, 89, 247–350. Rosell, D. & Uriz, M.J. (2002) Excavating and endolithic sponge species (Porifera) from the Mediterranean: species descriptions and identification key. Organisms, Diversity & Evolution, 55–86. http://dx.doi.org/10.1078/1439-6092-00033 Schmidt, O. (1870) Grundzüge einer Spongien-Fauna des Atlantischen Gebietes. Leipzig, 88 pp. Templado, J., Calvo, M., Luque, A.A., Garvía, A., Maldonado, M. & Moro, L. (2004) Guía de invertebrados y peces marinos protegidos por la legislación nacional e internacional. Ministerio de Medio Ambiente/Consejo Superior de Investigaciones Científicas, Madrid, 214 pp. Templado, J., Calvo, M., Moreno, D., Flores, A., Conde, F., Abad, R., Rubio, J., López-Fé, C.M. & Ortiz, M. (2006) Flora y fauna de la reserva marina y reserva de pesca de la isla de Alborán. Ministerio de Agricultura, Pesca y Alimentación. Secretaría General de Pesca Marítima, Madrid, 126 pp. Templado, J., García-Carrascosa, M., Baratech, L., Capaccioni, R., Juan, A., López-Ibor, A., Silvestre, R. & Massó, C. (1986) Estudio preliminar de la fauna asociada a los fondos coralígenos del mar de Alborán (SE de España). Boletin del Instituto Español de Oceanografía, 3, 93–104. Topsent, E. (1892) Contribution a l'étude des Spongiaires de l'Atlantique Nord. Résultats des Campagnes Scientifiques accomplies par le Prince Albert I. Monaco, 2, 1–165. Topsent, E. (1896) Matériaux pour servir à l'étude de la Faune des Spongiaires de France. Mémoires de la Société Zoologique de France, 9, 113–133. Topsent, E. (1904) Spongiaires des Açores. Résultats des Campagnes Scientifiques accomplies par le Prince Albert I. Monaco, 25, 1–279. Topsent, E. (1920) Spongiaires du Musée Zoologique de Strasbourg. Monaxonides. Bulletin de l'Institut Océanographique de Monaco, 381, 1–36. Topsent, E. (1928) Spongiaires de l'Atlantique et de la Méditerranée, provenant des croissières du Prince Albert I de Monaco. Résultats des Campagnes Scientifiques accomplies par le Prince Albert I. Monaco, 74, 1–376. Uriz, M.J. (2002) Family Ancorinidae Schmidt, 1870. In: Hooper, J.N.A. & Van Soest, R.W.M. (Eds. ), Systema Porifera: a guide to the classification of Sponges. Kluwer Academic/Plenum Publishers, New York, pp. 108–126. Vacelet, J. (1969) Eponges de la Roche du Large et de l'étage bathyal de Méditerranée (récoltées de la Soucoupe plongeante cousteau et dragages). Mémoires du Muséum National d'Histoire Naturelle, série A, 59, 145–219. Vermeij, G.J. 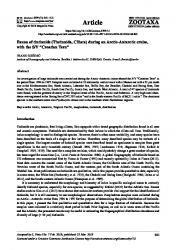 (2012) The tropical history and future of the Mediterranean biota and the West African enigma. Journal of Biogeography, 39, 31–41. Voultsiadou-Koukoura, E. & van Soest, R.W.M. (1991) Hemiasterella aristoteliana n. sp. (Porifera, Hadromerida) from the Aegean Sea with a discussion on the family Hemiasterellidae. Bijdragen tot de Dierkunde, 61, 43–49. Voultsiadou, E. (2009) Reevaluating sponge diversity and distribution in the Mediterranean Sea. Hydrobiologia, 628, 1–12. http://dx.doi.org/10.1007/s10750-009-9725-9 Wells, H.W., Wells, M.J. & Gray, I.E. (1960) Marine sponges of North Carolina. Journal of the Elisha Mitchell Scientific Society, 76, 200–245.